Investments by Cloud companies in mega datacenters and supporting networking infrastructure have created a new and very dynamic segment in the optical components and modules market. This report from LightCounting offers an in-depth look at the development of this new market in 2010-2017 and its potential growth in 2018-2023. The database provided with the report presents detailed sales projections of more than 50 product categories of Ethernet optical transceivers, DWDM optics, Active Optical Cables (AOCs) and Embedded Optical Modules (EOMs), segmented into three main applications: telecom, enterprise and cloud. The cloud segment includes optics used inside the mega-datacenters of Cloud companies as well as in the networks connecting the datacenters (known as the data center interconnect, or DCI segment). LightCounting estimates that sales of Ethernet transceivers to Alibaba, Amazon, Facebook, Google and Microsoft accounted for close to 60% of all Ethernet transceivers sold for applications in mega datacenters in 2017. Their share is projected to peak at 64% in 2020, but it will decline after that. We expect that several other Cloud companies will challenge the dominance of the Top 5 in 2021-2023. Chinese Cloud companies are the best positioned to challenge the dominance of U.S.-based vendors. Alibaba sharply increased its investments into high speed Ethernet optics in late 2017 and early 2018, and it is now included in the Top 5 category. Baidu and Tencent are the best-known Cloud companies in China that are likely to follow Alibaba’s lead in increasing their infrastructure spending. 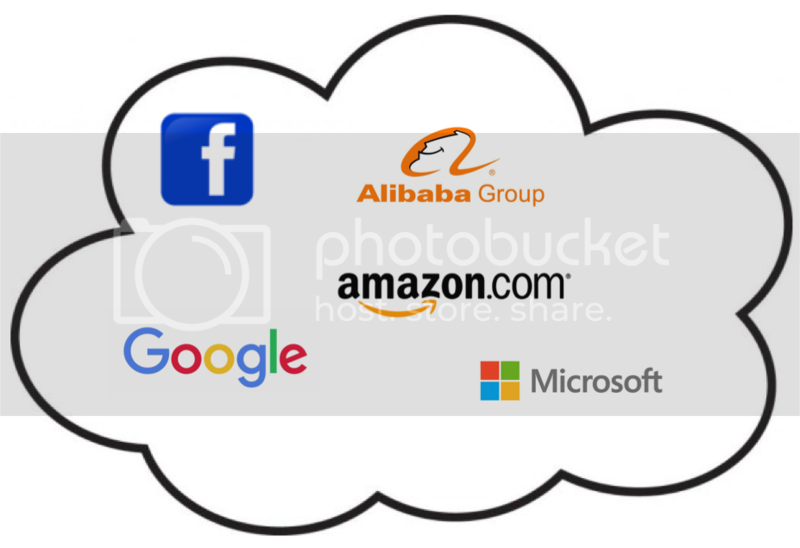 There are several other lesser-known Cloud companies in China that operate networks of datacenters, including Ksyun Cloud, QingCloud, UCloud and SpeedyCloud. Policies of the Chinese government favor the creation of new and the growth of existing Cloud companies in that country. Chinese consumers are adopting many Cloud applications faster than Western consumers, according to analysis presented in the LightCounting report titled “Market for Optics in China”. Current policies of the U.S. government for imposing new trade barriers will have a negative impact for international expansion of the U.S.-based providers of Cloud services. This will lead to faster growth of local Cloud vendors in many other countries, including India – home to 1.35 billion people. These new national champions will copy the business models of Amazon, Facebook and Google, including investments in local data centers equipped with the latest technologies. Alibaba, Baidu, and Tencent operate a distributed network of datacenters in many metro areas because of restrictions on building larger facilities in China. Mega datacenters operated by the Western Cloud companies are starting to transform into metro-regional clusters as their strategies evolve. Interconnecting these distributed facilities will require a lot of high-bandwidth optics. Amazon operates 25 datacenters interconnected with 3500 fibers in Ashburn, VA. Facebook expanded its mega datacenters by constructing new facilities in the vicinity of its existing ones. Microsoft announced its intention to build more metro and regional datacenters to reduce the time required for planning new facilities, along with achieving several other benefits. Cloud companies are also starting to invest in edge datacenters to position content and services closer to their end users. The direct impact of Cloud companies on the market for optical components and modules is substantial, but the Cloud companies’s influence on the market spreads far beyond billions of dollars spent on purchases of optics each year. Amazon, Google, Microsoft and more recently Facebook and Alibaba have shaken up the industry by accelerating innovations in technology, disrupting supply chain practices and challenging industry standards. Impact of these trends on the market for optical Ethernet and DWDM transceivers, Active optical Cables (AOCs) and Embedded Optical Modules (EOMs) is discussed in the report.